Hjördis Petterson: They think I'm horrible. I think so too. I think I'm horrible. I don't want to answer like I do, but the words just fall from my lips. I bite their heads off although I don't mean it. Then at night when I can't sleep I get so angry with myself. Everything just keeps growing and growing. And I always end up at the very bottom. Whatever I do, things just go wrong. I don't know what to do. Maybe this isn't the deepest film of Bergman - or the most spectacular film visually - but there is something with this movie that I like. 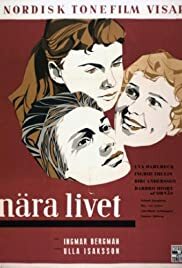 Maybe that's the stripped and easy settings, that's differently in comparison with other films directed by Bergman, or maybe that's the three interesting women's stories - that the film is about - that touches me. And maybe Bergman knew that. Maybe he knew that films about pregnancies and all that concern about that, touches people. Maybe he knew that it was an excellent idea to directing a film, that takes place in some gloomy hospital wards - for the gloomy settings, leaves space to a film that entirely focus on three - more or less - wounded souls. Maybe he knew that. Maybe he knew that it was the way to a masterpiece.